By Travis - Zambia - 18 Jan/04 - Viewed 9827 times. Back in do-it-yourself mode after forty-two days on the Absolute Africa truck, Abi and I took a taxi to the Lusaka bus stop and put our packages of souvenirs in luggage storage. All the seats for that day�s �luxury� buses to Livingstone were sold out, so we ended up taking a six hour ride on a minibus with our knees tucked up under our chins. We arrived in Livingstone just after dark, and, with the help of a couple friendly locals, made our way to Jollyboys Backpackers. The next morning, we headed to the national park on the Zambian side of Victoria Falls. 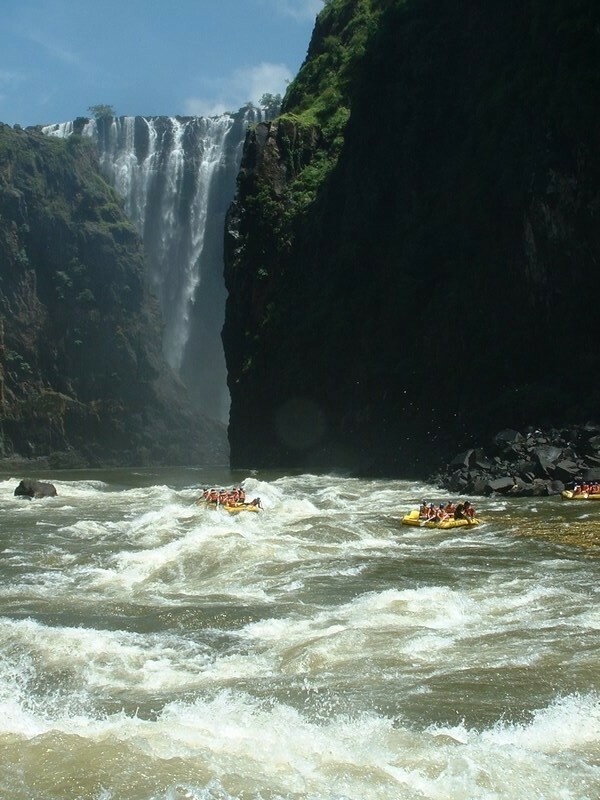 The Zambezi River was in the last couple of weeks of the low water stage, and most of the basalt gorge over which the river spills over the falls was visible. The mist rising from the base of the falls was heavy enough to soak our clothes, but it wasn�t so thick as to completely obscure our view of the falls as is the case during higher water. We were able to see the eastern half of the falls from four main viewing areas on the Zambian side. We didn�t cross over to see Victoria Falls from the Zimbabwe side, as visas and park entry fees would have cost $100 for the two of us. However, we were able to view the falls from the Zambezi River Bridge in no-man�s-land between the Zambia and Zimbabwe border posts. Bungi jumpers are frequently seen diving off the bridge toward the river 111 meters below, the world�s third highest bungi. We had discussed doing a gorge swing, zip-line, rappelling package the next day, but I secretly arranged an elephant-back safari as a surprise for Abi instead. After a briefing by the primary trainer, the two of us and eight others mounted the elephants in pairs for an hour and a half lumbering, bow-legged ride around a game park. The only other animals we saw on the safari were a troupe of yellow baboons, but we were more excited to be riding the elephant than by the scenery. We dismounted at the main camp and got to feed the elephants some tasty (at least they think so) pellets as their reward for following the trail and not trampling anyone. Most of the elephants are orphans rescued from starvation during the drought of 1994. They do one ride in the morning and another in the late afternoon each day, and are given a wide range during the rest of the day before being corralled for the night. Abi was ecstatic with her surprise, and it was a great experience to wrap up our time in Africa before starting a week of buses, trains, flights and lengthy layovers to make our way back to the States.